One and Only describes its line of resorts as "The world's most spectacular resorts in the world's most exotic destinations." Indeed, two of our favorite destination wedding locations for photography are One and Only Resorts: the One and Only Palmilla in Los Cabos, Mexico and the One and Only Ocean Club in the Bahamas. We can't wait for the new One and Only Santa Maria de Xala, located just south of Puerto Vallarta, Mexico to open. We're also looking forward to the grand opening of the new One and Only Mandarina in Riviera Nayarit near Punta Mita, Mexico. All these resorts offer incredible villas in tropical luxury with expansive ocean views, fine dining experiences, outdoor adventure, and the most romantic wedding settings! The One and Only Ocean Club is set on Paradise Island, a five-mile stretch of pristine beauty. The original gardens on the property were inspired by Versailles and its ceremony location is a 12th century Augustine cloister with terraced steps and dramatic arches - simply breathtaking! We love photographing weddings at One and Only resorts because each ceremony location is unique. At the One and Only Palmilla, the historic Chapel, the South Lawn, and Turtle Beach are all beautiful options to exchange vows. 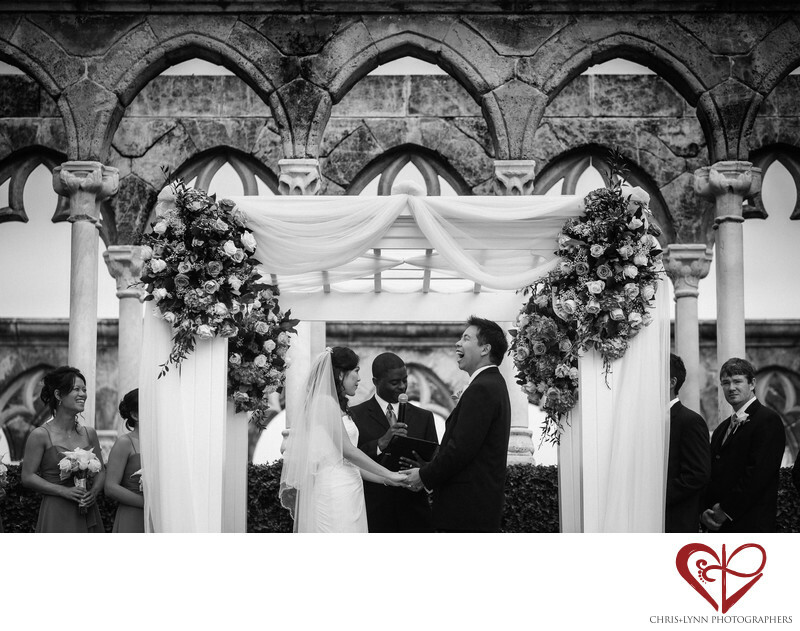 At the One and Only Ocean Club, The Cloisters, the location in this image, is a spectacular setting to exchange vows. The multiple stone arches create a dramatic frame for the bride and groom and their wedding party, and the surrounding grounds are lush and private. This photo was created during the ceremony as the groom shared his personally-written words of commitment that included several improvised jokes. We love when couples compose their own vows; it always adds a meaningful and personal touch to the ceremony. It also ensures some laughter or tears! While every wedding ceremony follows a similar format, we are always continually observant for the genuine and emotional reactions that may happen at any second. This groom's spontaneous and exuberant laughter is such a great wedding day moment at the One and Only. Location: One & Only Ocean Club, Nassau, Bahamas. 1/4000; f/3.5; ISO 400; 110.0 mm.